Brides often get a helping hand when it comes to the fit of their wedding dresses as they can generally expect to have a couple of dress fittings before the big day. When getting a suit made for you it's exactly the same – get looking six months before the day and expect a few fittings! However if you're hiring or buying off the peg, you may not know what to look out for. 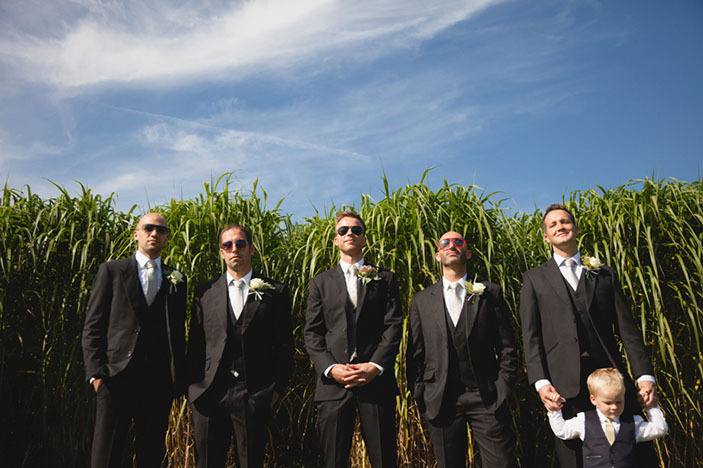 That’s where we can help, we can make sure that you look as sharp as possible on your Wedding Day! Far too many times I see gents come in wearing jackets that are far too big for them in the shoulders. The shoulders are the principle structure and support for a jacket, too big and everything will just sag from there. The edge of the shoulder should make a straight line down your arms – if the shoulders stick out past the arm, creating an upside down triangle shape they're too big! Aim for and straight vertical line instead. Along with trouser length, this is one of the principle causes of making men look like they're wearing their Dad's suits or like they've grown out of their school uniform. When it comes to jacket sleeve length the aim is to get it to rest on the top of your hand, just covering the wrist bone but not the hand. This keeps your hands free, your cuffs clean, and enables you to show about 1cm/1/2 and inch of shirt cuff. Just like sleeves, you need to get the right balance when it comes to trouser length. There's less of a set rule here as length is dependent on the style of trouser too. For example with a more classic, straight trouser leg you want the back of the trouser to sit roughly 1cm above the heel of your shoe and have a single break / crease in the front. Any longer and you risk your trousers dragging on the ground which is never a good look! If you're going for a slimmer leg style, however, you'll have to wear the length a little shorter. Getting that single break at the front is the best guide; too short and you will start showing socks and the trousers will flap around rather than sit on the shoe. Too long and the trousers start to gather at the bottom which is simply untidy and can make the ankle look wider than it actually is. No-one wants to look boxy on the big day, and creating some curves is a lot more flattering. Don't worry if you can 'feel' the jacket around you, although it may feel tighter than your everyday clothes. That's not a bad thing and is necessary if you want to create some shape! When the jacket is buttoned up just keep an eye out for 'cat whiskers' where you can see a few creases pulling at the front. When buying off the peg getting the balance between shoulders and waist is often the most difficult task, so my tip would be to get the shoulders right and then if the waist and sleeves need adjusting go and get that fixed – a well fitting suit will speak as loud as any dramatic style!